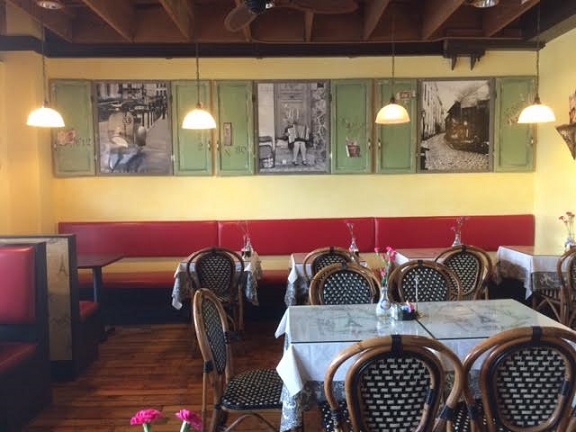 A touch of Paris now graces Claremont in this crepes restaurant in the Packing House. It’s part of a small chain — based in Orange County, there’s a location in Victoria Gardens — but this version, which opened in August, has a lot of charm, some inherent to the Packing House and its wooden floors, floor to ceiling windows and plank-like walkway, some attributable to the restaurant layout and decor. Outside are cafe tables and a take-a-book-leave-a-book cart; inside are wicker chairs and tables with tablecloths and fresh flowers. At the counter I ordered a spinach crepe ($9) and a blood orange soda bottled in France ($3.25). A good, light meal, made more enjoyable by the French movie projected on the far wall on a flatscreen TV bordered by a “Cinema” frame. It was “The Red Balloon,” followed by “Chocolat.” For more free entertainment, you can watch them make your crepe through a window into the kitchen. A sign by the window encourages customers to mail postcards from Paris for display. A reader of this blog was at another table with her family. 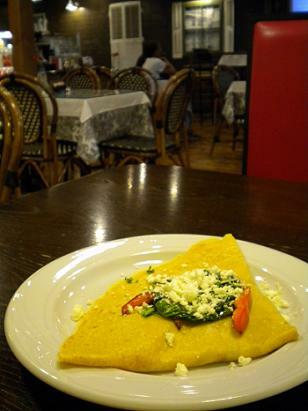 She thought her St. Louis crepe could have used a sauce, but her crepes suzette for dessert was pronounced excellent. You can view the menu here; it has no descriptions, so it’s not very useful. One of my fond memories from my trip to Paris earlier this year was buying a crepe with Nutella and banana from a sidewalk stand. It was served in a paper cone for walking. The prices at Crepes de Paris aren’t as good — $6 to $12 for a savory crepe seems high to me — but then, you won’t get jet lag visiting Claremont. 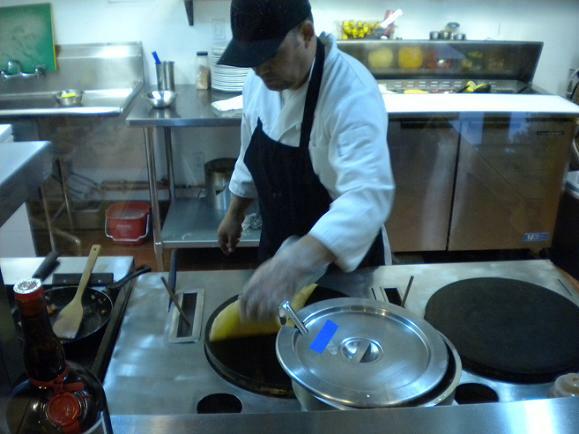 This entry was posted in Restaurants: Claremont and tagged Claremont, crepes by David Allen. Bookmark the permalink. 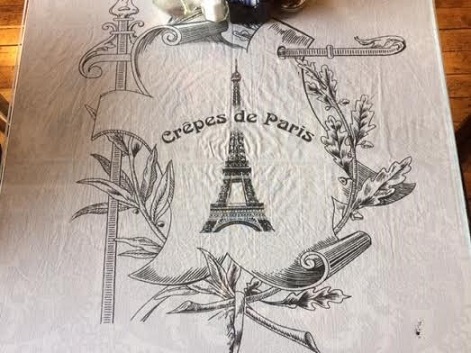 What restaurant was there before Crepes de Paris? Thanks for the review! Since you mentioned it in your column recently, I’ve been wanting to go try the crepes. I don’t suppose they are related to the Crepes Bonaparte food truck? I love crepes! I just discovered this little nook last week and got a take-a-way menu. I doubt if it is going to work with Weight Watchers, so it will have to be a special occasion, I guess. 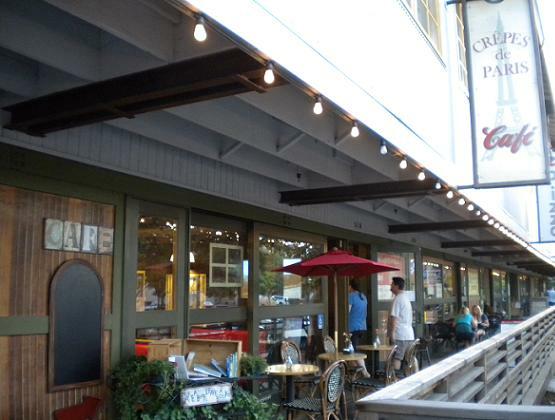 We used to have a little French restaurant in Montclair, about 20 years ago, “La Alouette”. My husband and I went there every week and had ice cream crepes for dessert. Tried Crepes de Paris yesterday with my mom and niece. I had the smoked salmon, my mom had the shrimp and my niece had the chicken and spinach. Then we all shared the Royal – sweet crepe with strawberries and nutella. Like Shirley said, not very Weight Watchers friendly, but they were all delicious!